The Prince and the Salmon People by Claire Rudolph Murphy is a story with a lesson. We experience this story through the eyes of a native Alaskan prince from a Northwest coastal tribe. The people in the Prince’s village become complacent, setting aside their traditional songs and ways of showing gratitude toward the animals that feed them. Because of their thoughtlessness they begin to experience a famine- the salmon no longer swim upstream to their village. 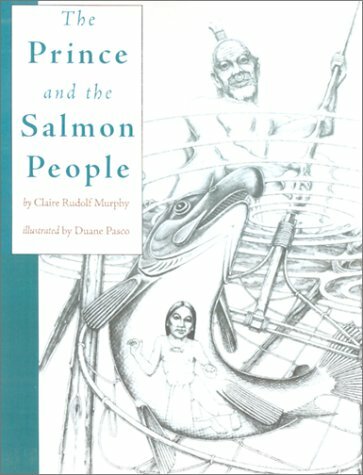 After a fight with his mother, the Prince runs away from home and is meets the Salmon People. The salmon people remind the Prince of the correct way to catch, prepare and eat salmon, in order to show them respect and honor them. The Prince is eventually returned to his village where he passes his knowledge on to his people. The people listen to the Prince and the salmon return to the village, offering themselves to the people. This story illustrates the importance of following tradition. There is a reciprocity between the humans and animals. Balance needs to be maintained. When traditional ways are ignored, when the people become lazy, disrespectful or selfish, they show a disrespect for each other, the environment and the animals which sustain them. This text is a great starting point in exploring native cultural values and beliefs. From this point you could branch out into cross cultural comparisons of oral traditions -meaning, themes, symbolism etc. How do stories change over time? How can some of these themes translate to modern day? What are some modern day symbols? How would you write these stories for a modern audience? Students could choose a theme and write a modern take on an old story or create a completely new story and perform it for the class -oral recitation or as a play. Everybody has a story. What stories do we hear today? Where did they originate? What is the purpose of retelling these stories? We could capture these stories in many forms -podcast, vidcast, comic, play etc. Students could also learn the art of interviewing and capture other people’s stories for future generations with the Story Corp project. Quality Literature -rating 3 The book is well written and illustrated. I felt like the story was well developed. It held my interest all the way to the end. Traditional Native stories that i have read do not really flesh out the characters. You have to judge them by their words and actions. And so it is with this story. Authority – rating 2 The book seems authentic but I know that the writer is not a native. I checked out her website. She is a history buff and an English Professor. She has published other historical books focusing on people who have been marginalized. The premise of the story seems sound- in harmony with what I have read regarding native traditions so I think she did her homework. The authenticity of the characters, setting and discourse and theme all seem sound. I would give them a rating of 3. As a non native I would probably elicit some other opinions before I used it in a class. It is always good to get other perspectives. I might not have caught something with my brief read through. What a great little story! Thank you for sharing! This sounds like a great story that shows the value of keeping customs and traditions prominent in a community. Looks like you have a great idea of how to use it in class.